The US Army Contracting Command (ACC) has awarded a contract to DynCorp International to provide a Maintenance Augmentation Team (MAT) for the Kuwait Air Force’s (KAF) AH-64D Apache helicopter maintenance programme. The competitively-awarded, fixed price contract has one base year with four option years and a maximum potential value of $25.4m, provided all options are exercised, under which the company will provide support for 16 KAF’s 16 AH-64D Apache Block II attack helicopters. The contract also includes supply of flight line services, quality control, downed aircraft recovery, operational planning, limited depot maintenance and conducting maintenance flight tests. MAT aims to help KAF achieve its aircraft operational readiness (OR) rate of 75% by enabling personnel to perform aircraft maintenance assistance, training, and providing mentorship to the KAF AH-64D Apache helicopter maintenance technicians and crewmembers. In addition, the MAT will also provide training and guidance on aviation maintenance and aviation maintenance management to KAF pilots. The Boeing AH-64D Apache is a four-blade, twin-engine attack helicopter armed with 16 Hellfire missiles and integrated sensors, networking and digital communications to provide situational awareness for ground commanders. The helicopter features a fully integrated avionics and weapons plus a state-of-the-art modem that transmits real-time, secure, digitised battlefield information to air and ground forces. The Apache Longbow has the ability to rapidly detect, classify, prioritise and engage stationary or moving enemy targets at standoff ranges in nearly all weather environments. DynCorp has also worked as a partner for supporting the air force’s fleet of 39 F/A-18 Hornet aircraft programme since 1997. 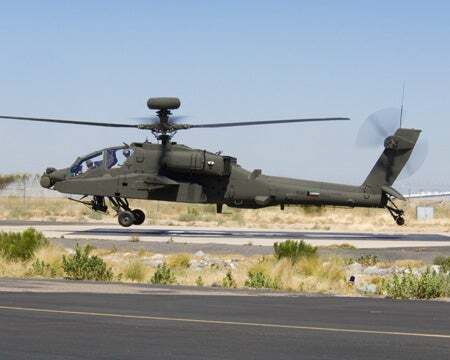 Image: Kuwait’s first AH-64D Apache Longbow helicopter at The Boeing Company site in Mesa, Arizona, US. Photo: Boeing. Forward Components Inc provides material support for critical application and safety components for the aerospace, defence, and automotive sectors. FN Herstal provides airborne systems with unprecedented and unequalled firing capabilities for multi-role helicopters and subsonic aircraft while maintaining simplicity of use and crew safety. VPT is a global provider of critical power conversion solutions for avionics, military, and space applications. The 3A DVPL Series of DC-DC point-of-load converters can be used alone or in conjunction with traditional isolated DC-DC converters as part of a highly efficient, reliable, distributed power system.